Italy came up with another good quality film which dealt with the issue of two men's bonding with one another. Matteo and Francesca are good friends with another couple - Diego and Shary. In their vacation by the beach, where Diego and Shary's young adult son came back from New York to join them, all hell broke loose. Shary disagreed with Diego over the responsibility of the upbringing of David. Matteo began to question his commitment to Francesca when his feeling began to betray him. He could not get over his thoughts and temptation for David. I enjoy gay themed films from Europe and South America. They are more likely to be good films with strong story plots, unlike USA, which is producing more and more trashy B-grades gay themed movies. 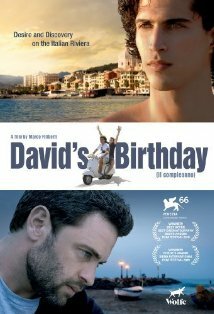 David's Birthday is another excellent movie from Italy, where there is an invitation for movie lovers to enjoy thoroughly where the director is trying to convey to us. Personally, I was disappointed that the gay plot comes in only after half-way of the film, and it does not dwell much on it, until the intense ending. And the ending is another film just like South Korea's Frozen Flower (2008), which is more likely to paint an ugly conclusion on the gays. Il Compleanno sounds a lot like Mulligans. Though the premise seems fun.